Grand Central Publishing, 9780446198240, 320pp. Walter Mosley delivers at last the compelling master work everyone's been waiting for--a novel so intriguing, so soulful, so unstoppably dramatic that it will rank among the classic mysteries of our time. At the height of the riots that cripple LA in the summer of 1965, a white man is pulled from his car by a mob and escapes into a nearby apartment building. Soon afterward, a red-headed woman known as Little Scarlet is found dead in that apartment building--and the fleeing man is the obvious suspect. The police ask Easy Rawlins to investigate. What he finds is a killer whose rage, like that which burned the city for weeks, is intrinsically woven around race and passion. Rawlins's hunt for the killer will reveal a new city emerging from the ashes--and a new life for Easy and his friends. 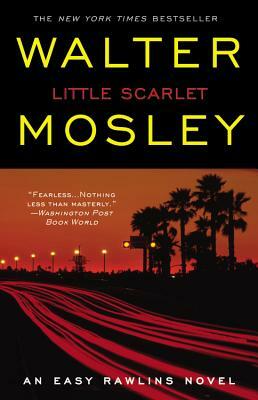 Mosley's lean and muscular vernacular captures the heat and the rhythm of Los Angeles' heart, where danger is the common currency of everyday life.